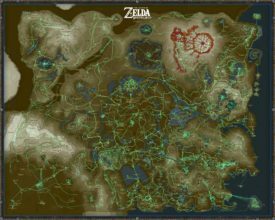 Despite it looking like an artist trying to be “creative” with a highlighter, the Hero’s Path Mode in Breath of the Wild is a great way to see the progress you’ve made in the game. There are a lot of uses you can get out of this mode if you know how to use it just right. Take for instance Reddit user kazoodac, who used this simple tracking feature to create something very touching. After having so much fun playing Breath of the Wild with their partner, kazoodac wanted a way to commemorate their experience playing through the game. Thanks to the Hero’s Mode feature that came with The Master Trials DLC, they got the idea on how to do just that. Combining the use of the Switch’s image capture feature and Adobe Photoshop’s photomerge tool, kazoodac created a 16×20″ poster at 300 dpi that now hangs framed above their game room wall. 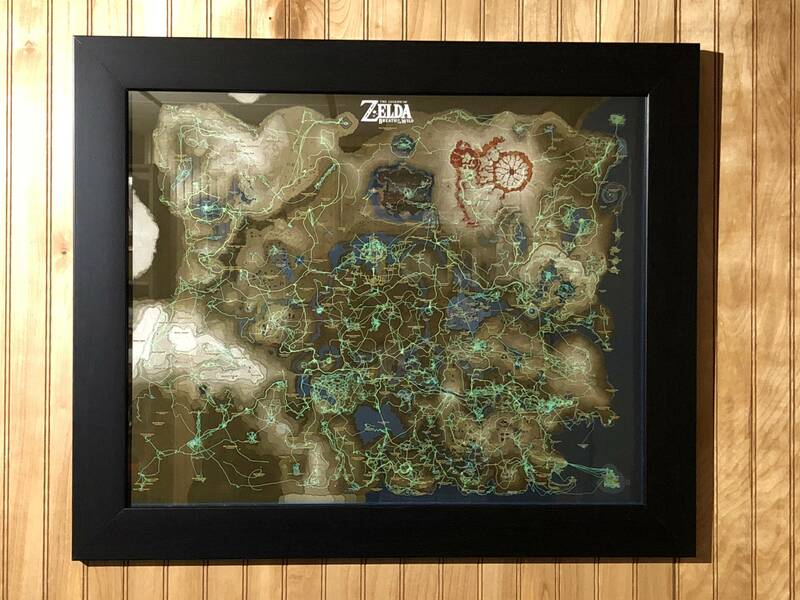 After capturing over 200 images of their game map and merging them together, the resulting image (which can be seen in the gallery below) came out to 5842×4868, just shy of what was required to get a 16×20″ print. The biggest challenges came in cropping each piece of the map and merging the images together. The one major piece of advice kazoodac gives is when trying to merge all 200+ images together in Photoshop, don’t do it all on one file; otherwise it will crash on you. This isn’t the first time kazoodac has created a Nintendo piece of art either. They also worked on a customized Samus amiibo to celebrate Metroid’s 30th Anniversary, as well as a minimalist-style N64 logo design. What do you think of this folks? How dedicated are you to try and create something this amazing? Let us know in the comments below!